Our European buying trip was a big success. We brought back some of the items, but the bigger and heavier items are being shipped. Following is a little preview. These items are not even listed on my site yet. 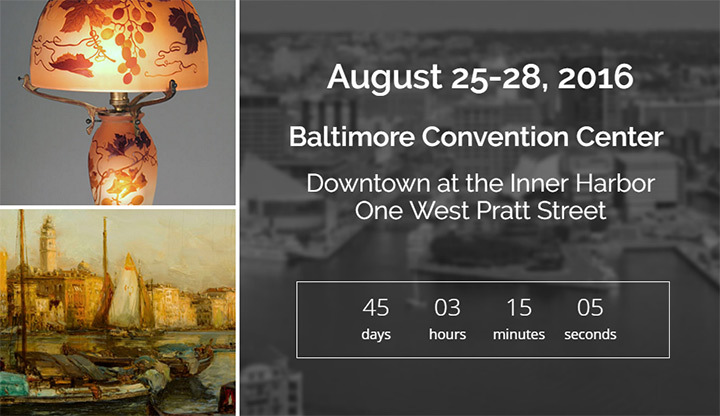 It’s already August and our next show, the eagerly anticipated Baltimore Summer Antiques Show, is coming very soon, August 25-28, 2016. It’s the best show of the summer and maybe now the best of the year (with all the changes coming this winter in Miami). People fly in from all over the world to attend, including from as far away as Japan. If you haven’t yet visited, you should. It’s big, with some of the best national and international dealers. You’ll also enjoy Baltimore. Hope to see you there! In the meantime, we’re very much in business. Call or email me with your wants or items for sale. If you have what I’m looking for, I’m paying the highest prices. My decisions are quick and my payments just as quick. Just snap a photo and email it to me. I always strive to offer the finest objects for sale on my website and at every show. I will continue to list more as often as possible. Please click here to take a look.There are many items for sale, sold items with prices and free lessons about glass and lamps. And remember to keep reading my blog. Sotheby’s Paris held a Design sale on May 24, 2016 with total sales of €7,831,725 ($8,765,100). Included in the sale were just a few French glass vases, some of which did very well. 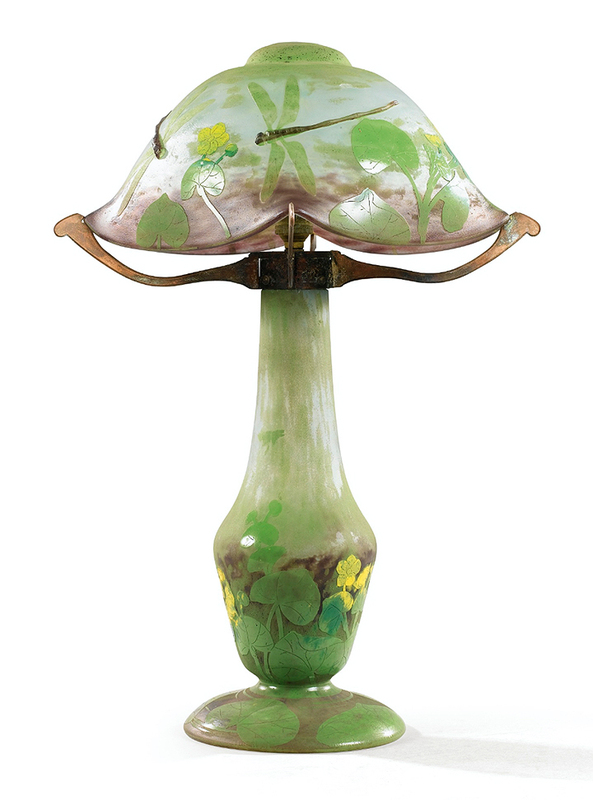 Lot #8 was the only Daum item in the sale, a Dragonfly table lamp. It almost doubled its pre-sale high estimate of €20,000, realizing €40,000 ($44,769), including buyer’s premium. Ordinarily this is the kind of item that I would bid on, but it just didn’t appeal to me from the photos. I didn’t like the color, nor the lack of a dragonfly on the base, nor the height of the base (which looked short to me.) But guess what? The buyer didn’t consult me first. What is wrong with them? A rare R. Lalique vase, lot #16, Nadica, almost tripled its high estimate of €20,000, realizing €58,750 ($65,750), including buyer’s premium. 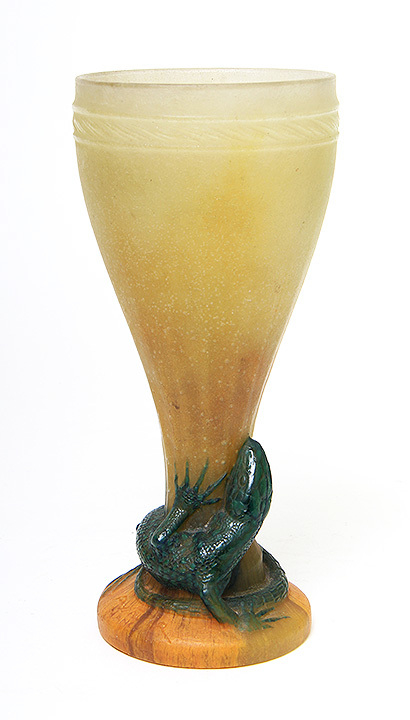 In other results from the sale, a Gallé padded and carved vase with a bronze foot failed to sell with a €25,000 — €35,000 estimate and an R. Lalique frosted Serpent vase sold for €10,625, against a pre-sale estimate of €6,000 — €8,000. No shows until July, when we’ll be in Denver for the Denver World Wide Antique Show, July 15-17, 2016. In the meantime, we’re very much in business, so call or email me with your wants or items for sale. If you have what I’m looking for, I’m paying the highest prices. My decisions are quick and my payments just as quick. Just snap a photo and email it to me. 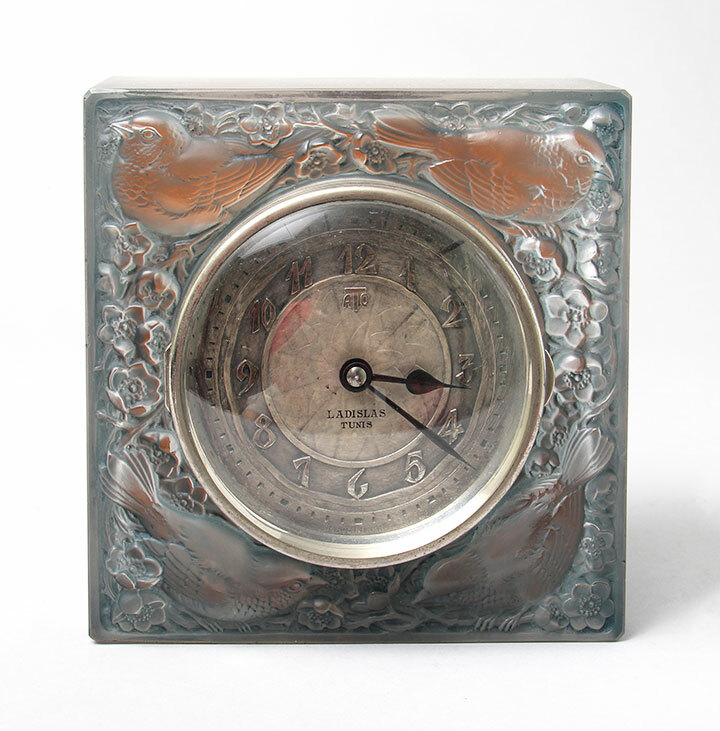 Grogan & Company, Boston, MA, held The September Auction on Sep 27, 2015. 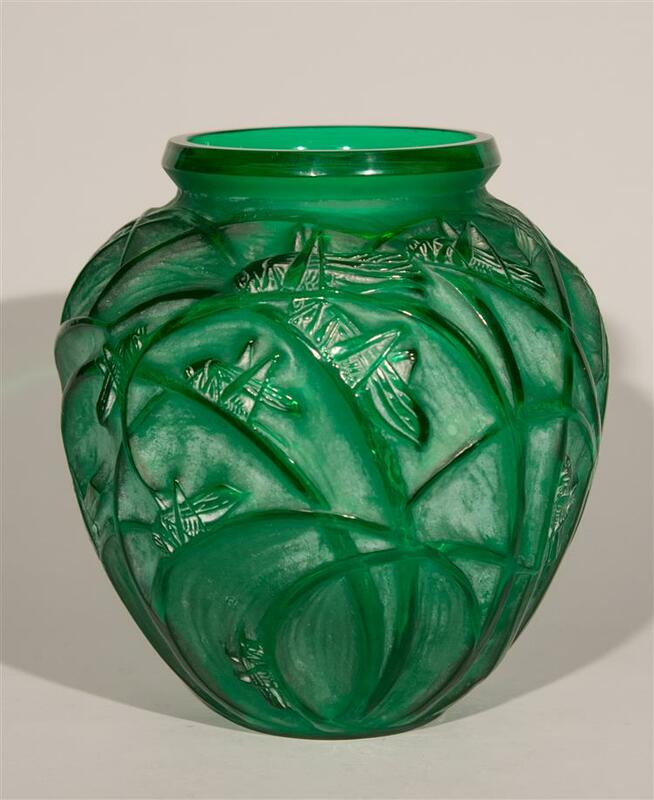 Included in the sale was lot #192: an R. Lalique Sauterelles vase in green. The low estimate of $3,000 – $5,000 made it seem like there was a chance I could buy it. Occasionally something falls through the cracks, and I’ll be there to catch it. Not this time! 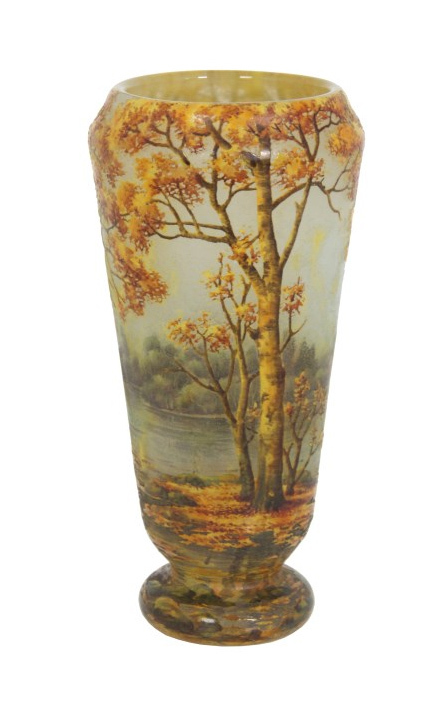 The vase sold for $15,860, including buyer’s premium. 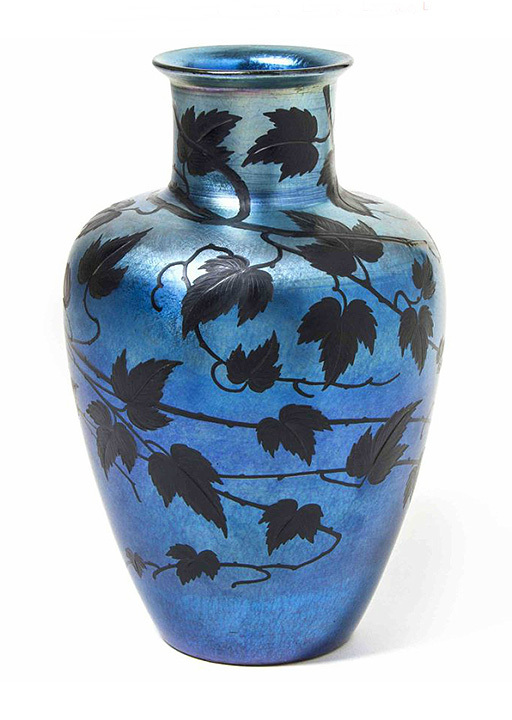 Fontaine’s Auction Gallery held a nice general sale this past Saturday, October 3, 2015. We drove all the way to Pittsfield, MA, just to preview the sale as there were quite a few lots I wanted to purchase. In general, the results were strong, so we wound up buying very few items. 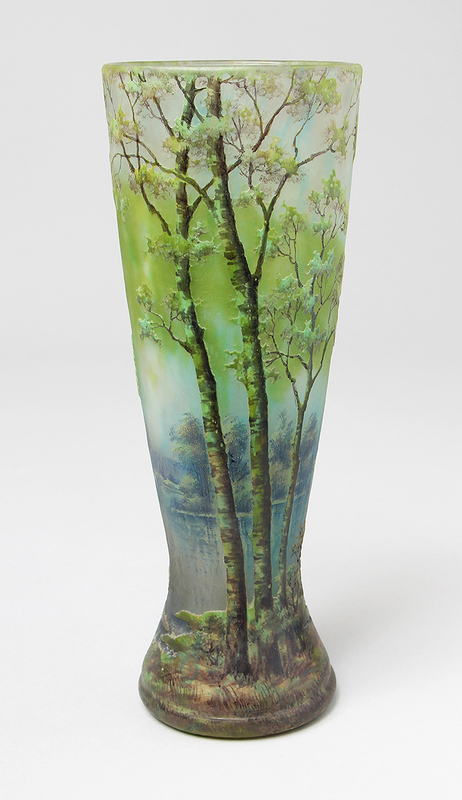 All the best ones sold for more than we were willing to pay, starting with lot #1, a beautiful, but small (6″), Daum Nancy scenic vase, decorated by Daum’s best artist, “B.S.”. Estimated to sell for $800 – $1,200, it realized $8,470, including buyer’s premium — too much for a dealer, but not a collector. 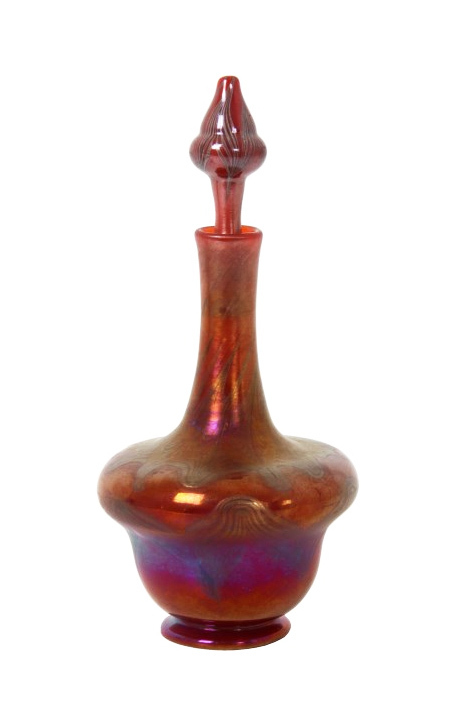 I also wanted to buy a small (3¼”), but very nice, decorated red Tiffany Favrile vase, Fontaine lot #43. It also went too high for me, but not a collector — $6,957.50, against a pre-sale estimate of $4,000 – $6,000. Lot #67 generated even more excitement. It was a very rare Tiffany Favrile red decorated perfume bottle, 6½” tall. Tiffany didn’t make many perfume bottles, let alone decorated red. The problem for me was that it only had a Tiffany paper label, with no signature on the glass. Most of my clients insist on a signature on the glass, so I took a pass on this lot. Well guess what? Fontaine’s didn’t need me. It sold for $16,940, against a pre-sale estimate of $4,000 – $6,000. For the complete catalog of the Fontaine sale, click here. 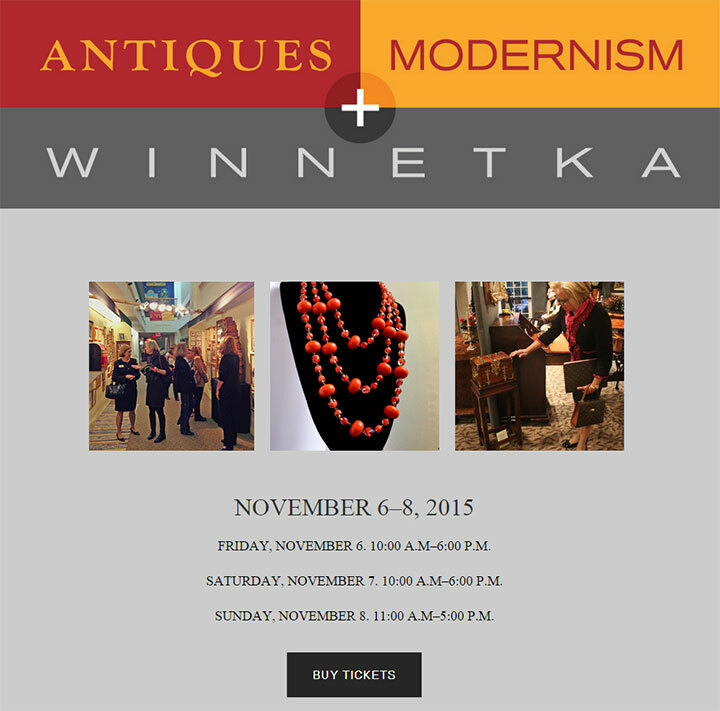 Our next show will be at the Winnetka Community House in Winnetka, IL, November 6-8, 2015. We used to exhibit at shows in the greater Chicago area 4-6 times yearly. Most of them have disappeared, so we now only exhibit in Chicago twice a year, once in the fall in Winnetka and once in the spring in Glencoe at the Chicago Botanic Gardens. Too bad, because we like Chicago and have lots of friends and clients. We’re really looking forward to seeing you at the show, so please put the dates in your calendar. 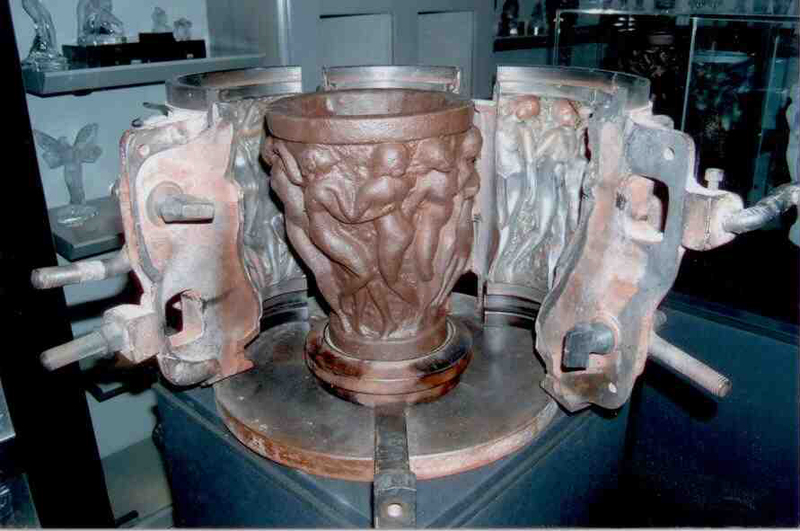 Ever wonder how a Lalique vase is made? 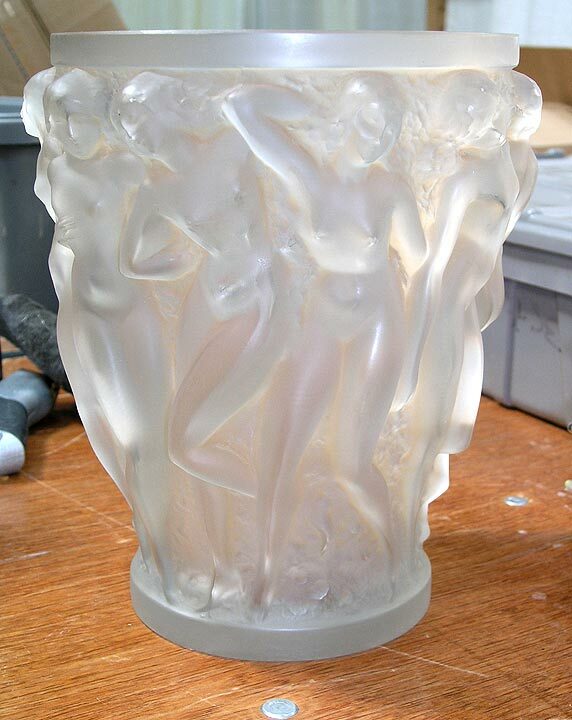 Lalique vases are made in molds, as opposed to French cameo vases that are usually hand-blown. That means that a sculptor first has to hand-sculpt an original, usually of clay. From there several molds are cast until the final iron version is ready. 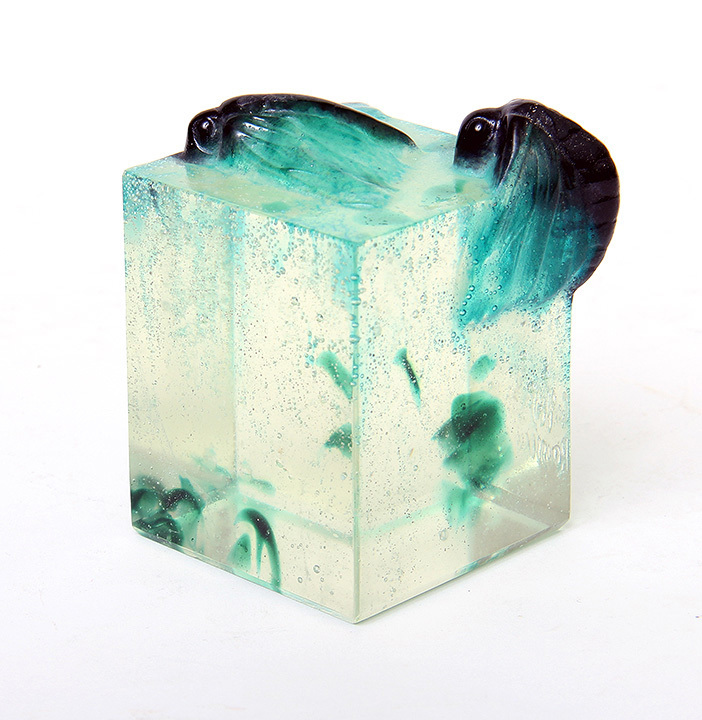 Molten glass is injected into the mold and then cooled very slowly, usually over 24 hours or more. The process is called annealing and its purpose is to remove stress from the glass, so it doesn’t crack. After the cold vase is removed from the mold, it goes to a glass finisher who grinds the rim, the base and any irregularities until the vase is smooth and sits flat. Finally the vase is signed and ready for sale. Different glass can be injected into the same mold to create variations, which may include different colors or opalescence. 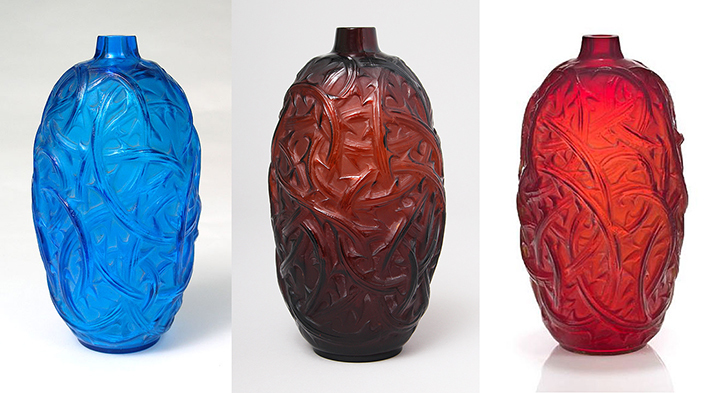 Many modern collectors look to obtain colored variations of the same vase, which always command premium prices over their colorless cousins. Certain rarer colors, like red, are the most sought after. Our next show is new to our schedule and almost upon us. 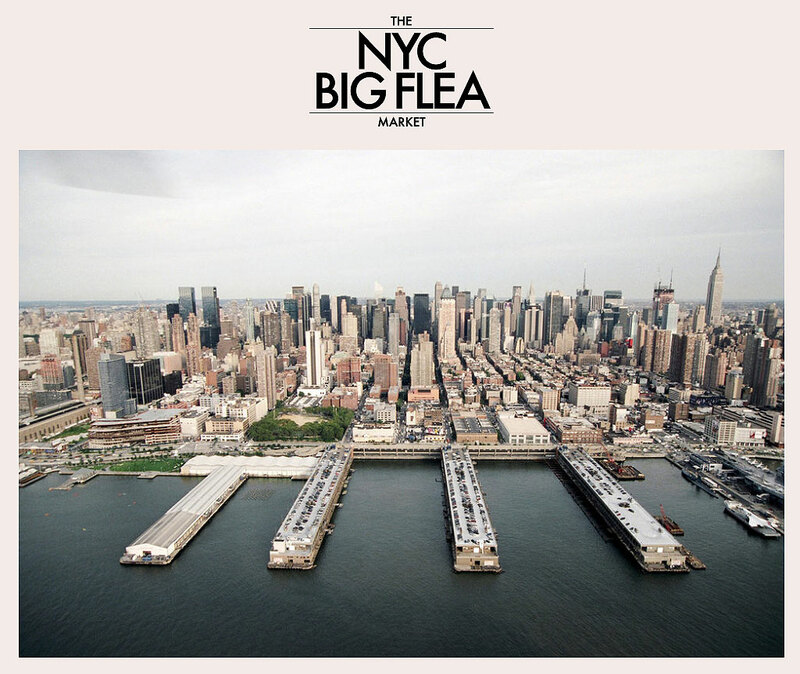 The NYC Big Flea Market will run two weekends from now, September 27-28. The new promoters, D’Amore Promotions, will be using the same Pier 94 that is used by USA Antique Shows for their November and March shows. This one will be substantially different, with an entirely new cast of dealers. Click here for more information. I’m bringing a lot of special items, so come and visit me at the show. 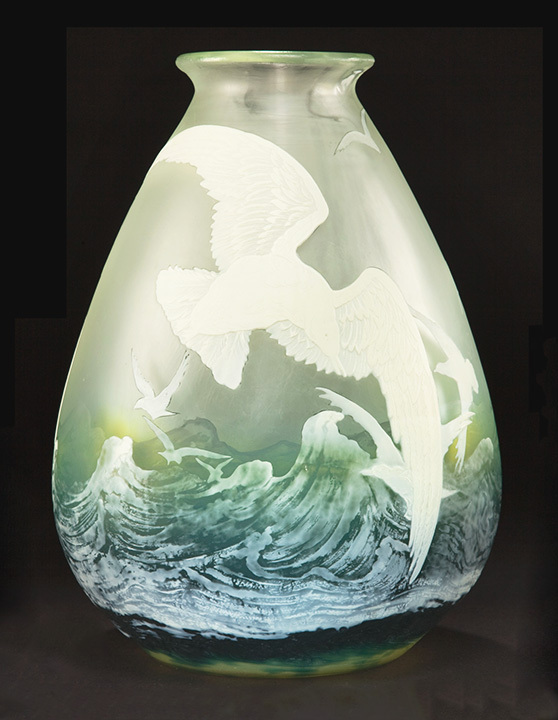 Christie’s South Kensington held a Lalique auction on May 22, 2013, with some rare items selling for very strong prices. Total sales for the 185-lot auction were a very respectable £799,812 ($1,244,307). Top lot of the sale was #99, a very rare car mascot entitled Comète (Comet), No. 1123. It sold for approximately double its low estimate of £35,000, realizing £79,875 ($120,851), including buyer’s premium. Christie’s expected the final lot of the sale to take top honors, but it took second place. 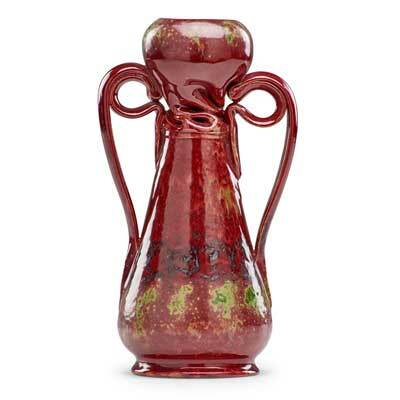 Lot #185 was a very rare red Hirondelles (Swallows) vase. It exceeded its high estimate of £50,000 to sell for £73,875 ($111,773). 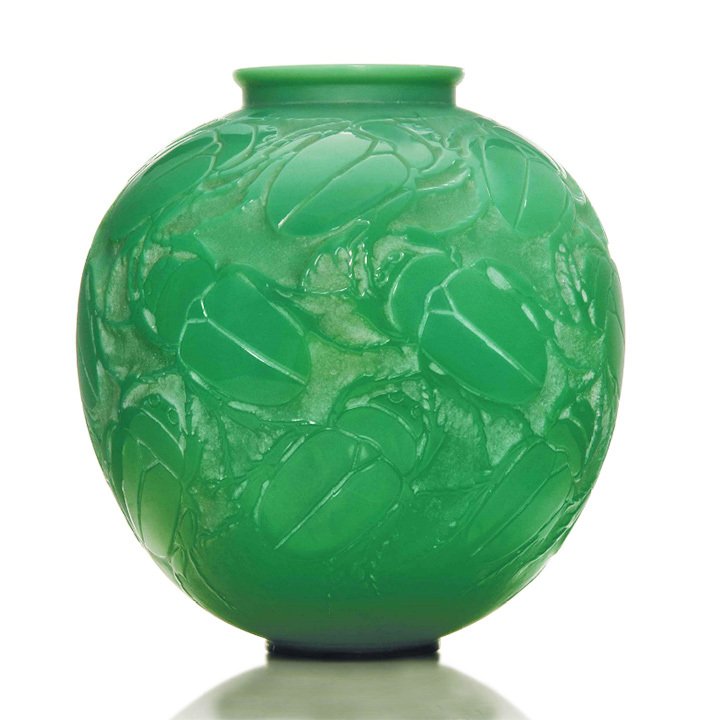 Third place went to lot #181, a rare green cased vase entitled Gros Scarabées (Large Scarabs). It easily exceeded its pre-sale estimate of £25,000 – £35,000, to sell for £49,875($75,461). The same model, in a rarer red color, selling as lot #180, sold for less money, £33,750($51,064), because of a condition problem (grinding of the rim exterior). No shows until July 19-21, when we’ll be in Denver. A fellow dealer convinced me to try the show again. She said the show has new promoters, who filled the hall with buyers the last time. So we’ll give it one more shot. In the meantime, don’t hesitate to call or write if you would like to buy, sell or trade. 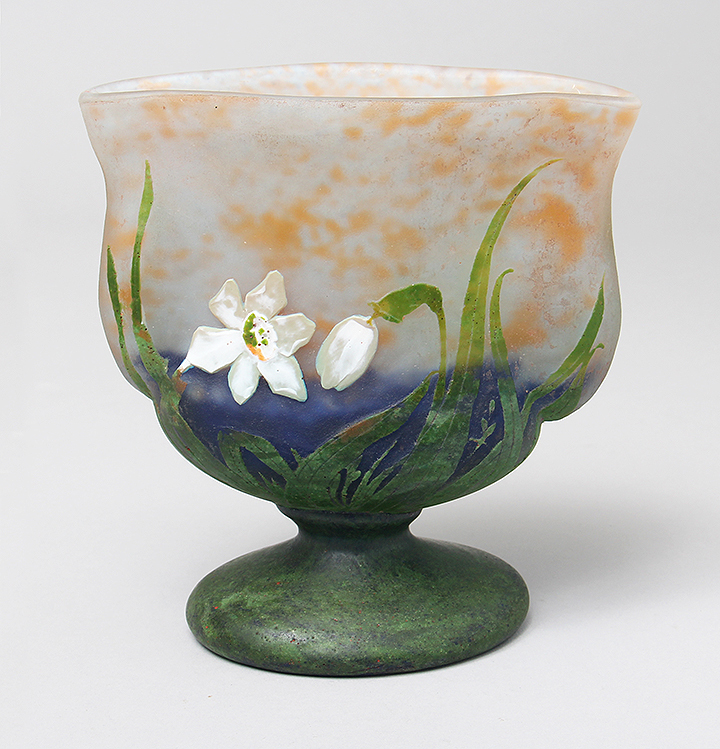 Click here to view French cameo glass for sale. We always strive to offer the finest objects for sale on our website and at every show. Look around my website. There are many items for sale, sold items with prices and free lessons about glass and lamps. 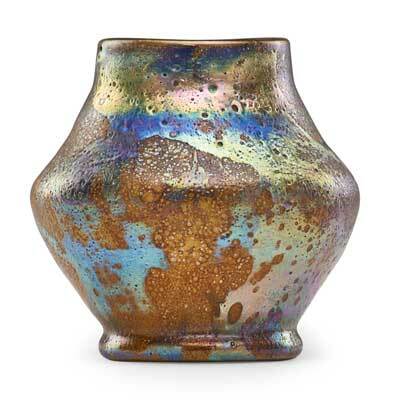 Leslie Hindman Auctioneers, of Chicago, held a 20th Century Decorative Arts sale yesterday, May 1, 2013, with some excellent results. 507 lots crossed the block, with the pottery section of the sale scheduled for today, May 2, 2013. Leading the way were Art Deco bronze & ivory figures by the likes of Preiss, Chiparus and Colinet. 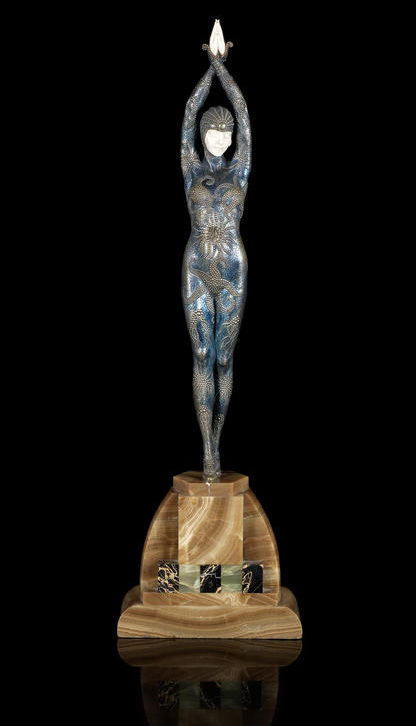 Two lots tied for top honors — #333, a Preiss group entitled The Bathers and #337, a Colinet figure entitled Ankara Dancer, both selling for $50,000, including buyer’s premium. Even though the prices were the same, the Preiss had a much better result, selling for almost 10 times its high estimate, while the Colinet sold below its low estimate. 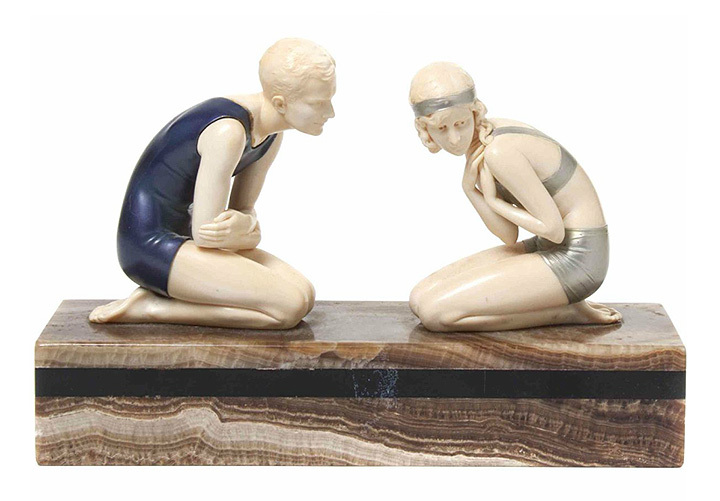 The market in Art Deco bronze & ivory figures has been strong for decades and has legs (no pun intended). 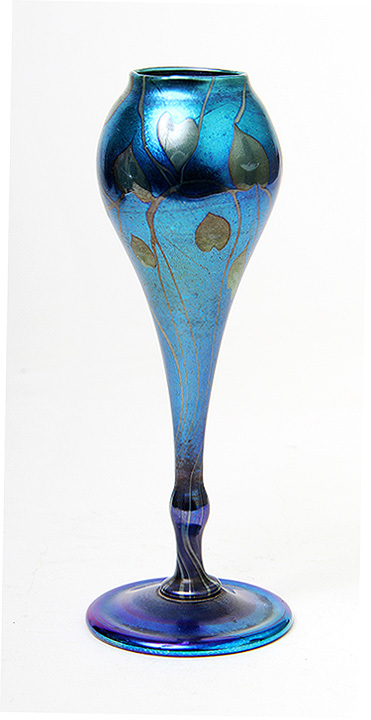 Top lot of the Tiffany Studios glass section of the sale went to #130, a fine-quality blue Favrile wheel-carved vase. 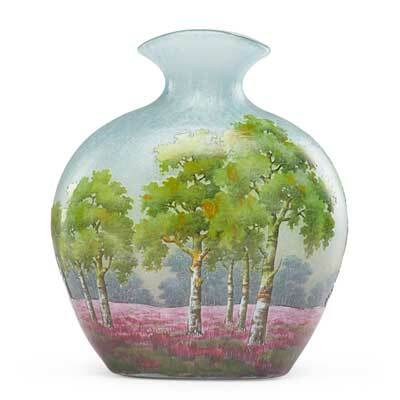 It easily exceeded its pre-sale estimate of $2,000-4,000, to realize $11,875, including buyer’s premium — a handsome price for a 9″ vase. There weren’t many R. Lalique lots in the sale, but a couple were special. 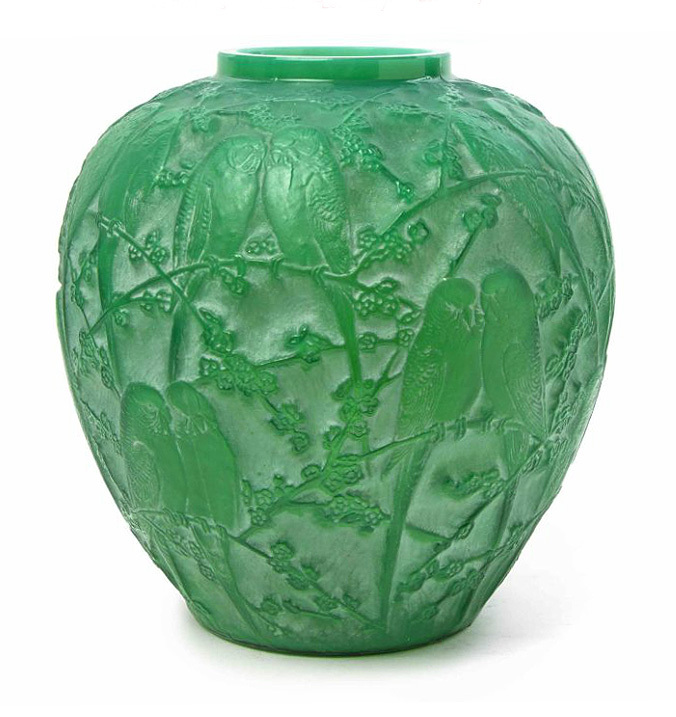 Lot #301 was a rare, green cased Perruches vase. Estimated to sell for $10,000-15,000, it realized $27,500, including buyer’s premium. 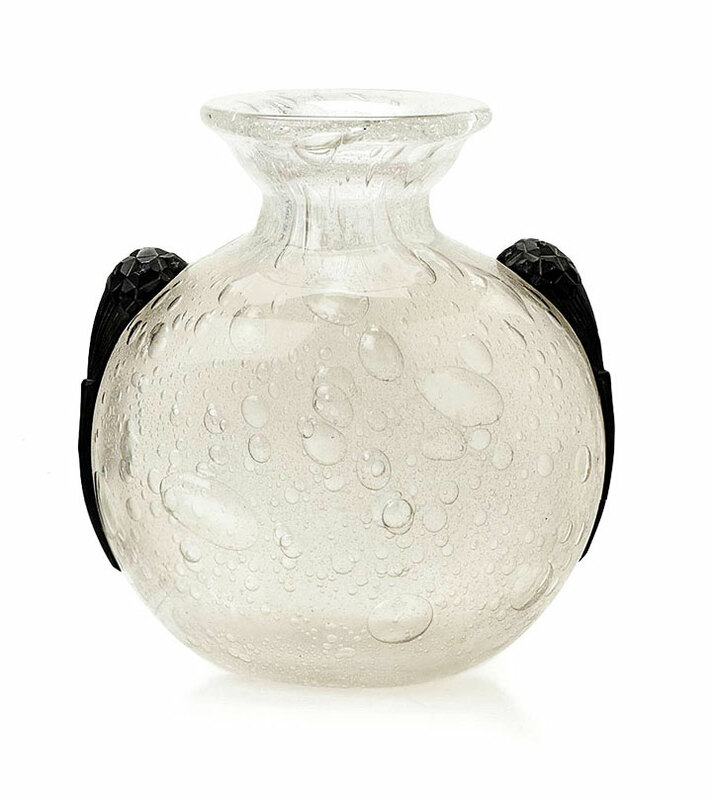 An even more rare object, an opalescent Tresor de la Mer perfume, sold for more money, $57,500, but below its low estimate. No shows until late July, but we’re still very much in business. Please don’t hesitate to call or write. We’re always interested in buying, selling or trading. Look around my website. There are many items for sale, sold items with prices and free lessons about glass and lamps. I regularly add Tiffany vases, lamps and desk accessories, as well as French cameo glass by Galle and Daum Nancy and etchings by Louis Icart. Here’s the link. Philip Chasen Antiques. 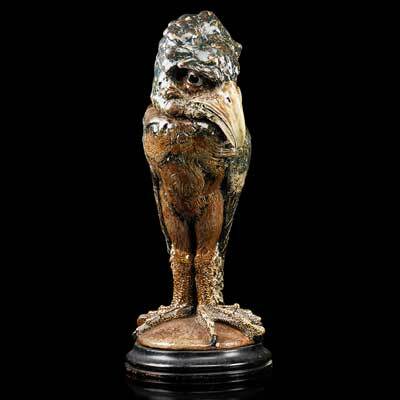 Bonham’s held its Chiparus, Lalique & The Decorative Arts auction in London on November, 14, 2012, with mixed results. Demetre Chiparus bronze and ivory figures sold well, but Rene Lalique items did not. 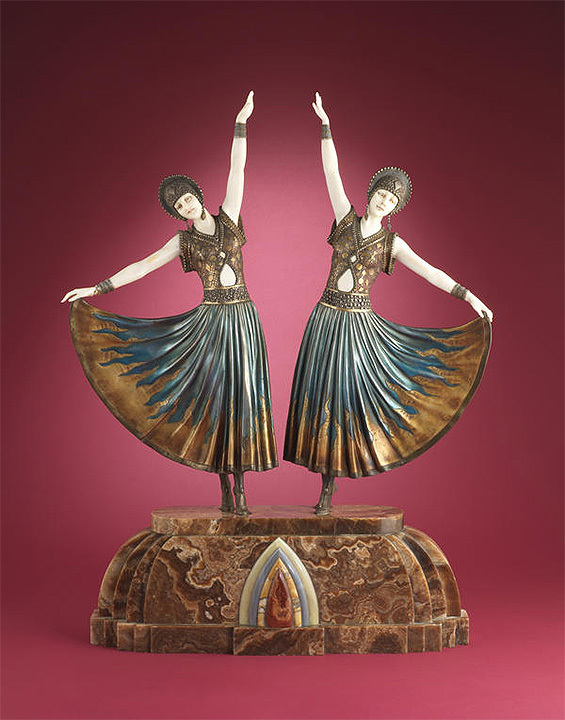 The top lot of the sale was #78, a bronze and ivory grouping entitled The Dolly Sisters. Estimated to sell for £150,000 – £200,000, it realized £277,250 ($444,136) — slightly above the high estimate, including buyer’s premium. Others Chiparus bronze & ivory figurines also did well, with Starfish selling for £91,250 ($146,165) — near its high estimate of £85,000. 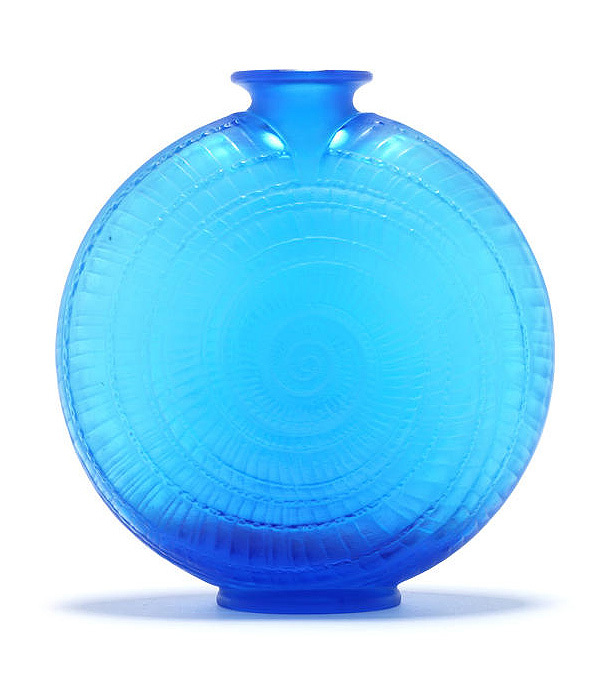 The top R. Lalique vase in the sale was lot #192, an electric blue Escargot vase. It sold for £49,250 ($78,879), near the low estimate, including buyer’s premium. 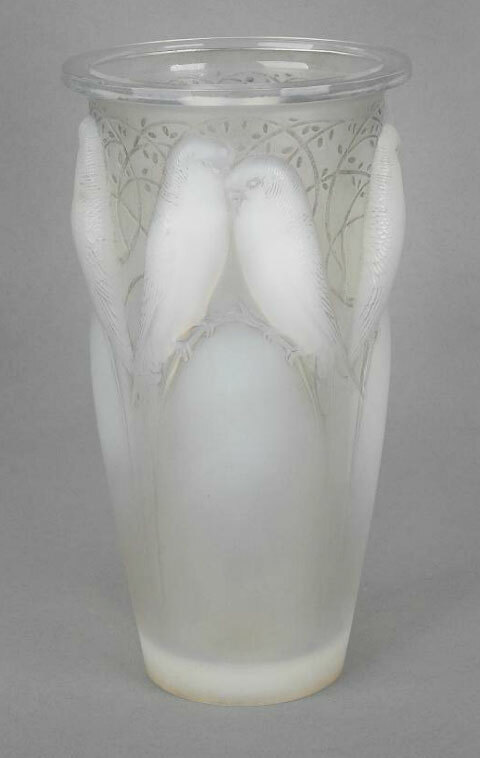 Many Lalique vases did not sell, probably because the estimates were too aggressive. Conservative estimates almost always achieve the best results. For the complete results of the sale, click on the following link. Bonham’s London Chiparus & Lalique results. Click this link to view some of the new objects I recently purchased and listed. French glass for sale. We always strive to offer the finest objects for sale on our website and at every show. Coyle’s Auction Gallery of Bellingham, MA, held their summer auction on June 10, 2012. Many of the items were estate fresh, including a fine Grueby two color vase and an R. Lalique bowl and plate. They both did quite well. The Grueby vase was two-color, with yellow flowers and leaves on a standard Grueby green ground, repeating three times around the vase. The vase was in “as found” condition, which meant that it was filthy, but in otherwise perfect condition. That’s when you know an item is really estate fresh. It sold for $10,250 + buyer’s premium, for a total of $11,787.50 — impressive! 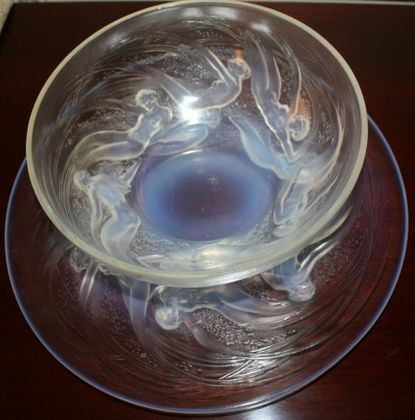 An opalescent R. Lalique bowl and plate with mermaids were sold together as one lot. 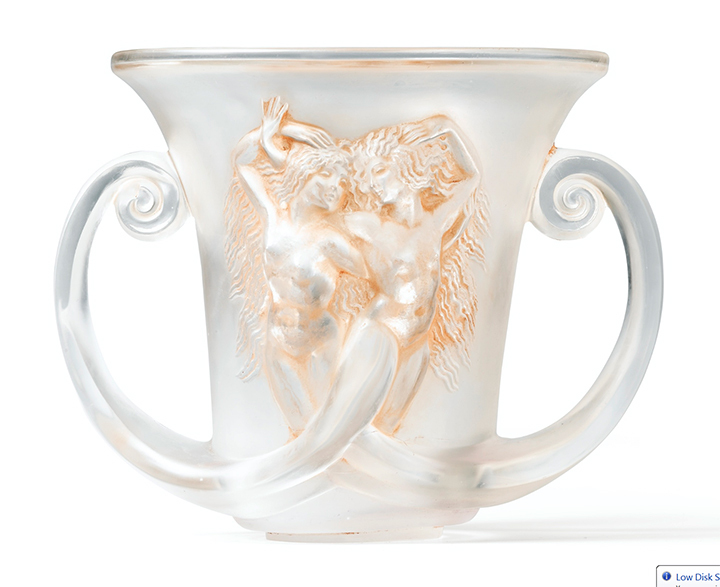 Continuing the strength for good or better R. Lalique at auctions everywhere, the lot sold for $3,565, including the buyer’s premium. 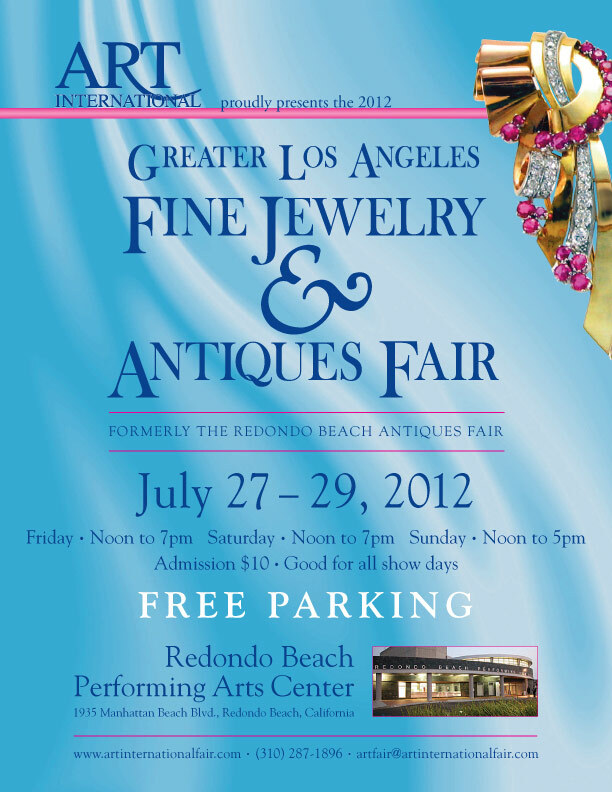 We’ll be exhibiting at the Redondo Beach, CA antique show July 27-29. Please come and visit us and show support by considering purchasing something. This will be our last time exhibiting in the greater LA area if we don’t sell enough to make it worth our while. In the meantime, we’re still very much in business. Don’t hesitate to call or write, and let us know what you’d like to buy, sell, or trade. 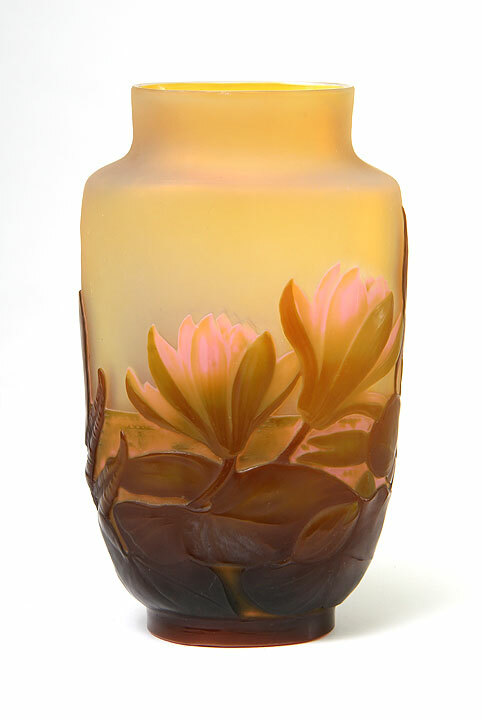 Pook & Pook held their Decorative Arts Sale on June 28, 2012. 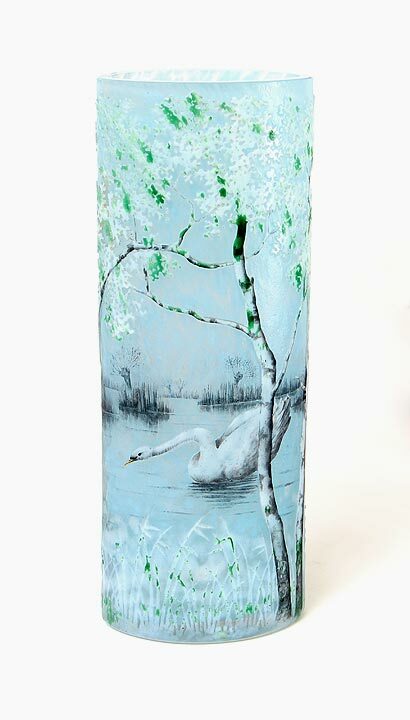 Most of the glass in the sale was from the collection of Charlene Sussel of Garrett Park, Maryland. 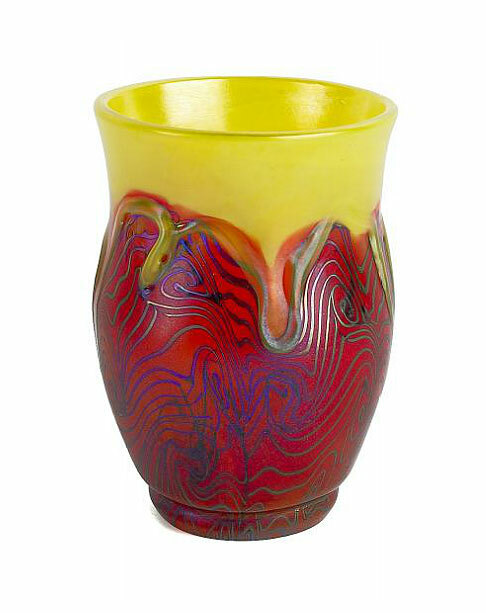 Included in her collection was a fabulous red and yellow decorated Tiffany Favrile vase. Though diminutive in size at 4″, it was not in rarity or quality. The very low estimate of $400 – $600 showed that it was there to be sold. There is nothing better than fresh-to-the-market, top quality merchandise at bargain basement estimates — it’s like mice to cheese. 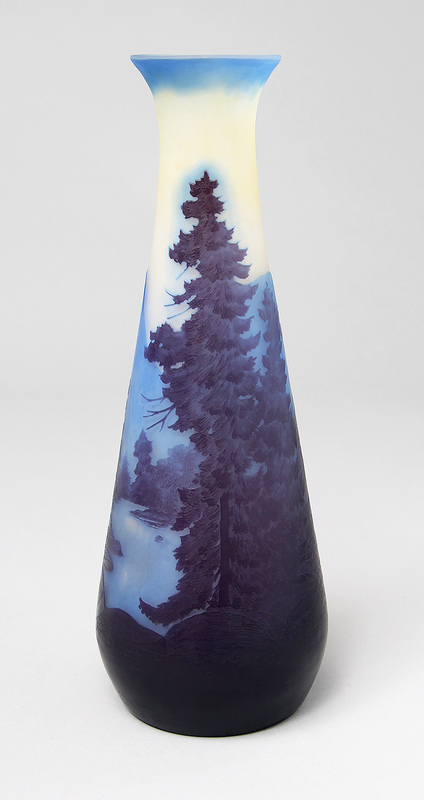 As a result, the price soared to $28,440 — not bad for a 4″ vase. I thought it was a $15,000 vase, so even I was surprised, but not shocked. 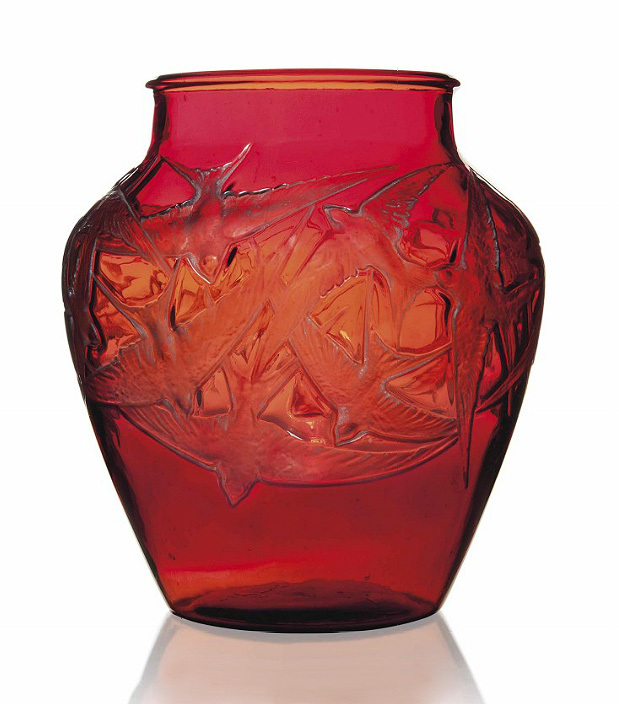 Good R. Lalique vases continue to show strength, no matter the auction. 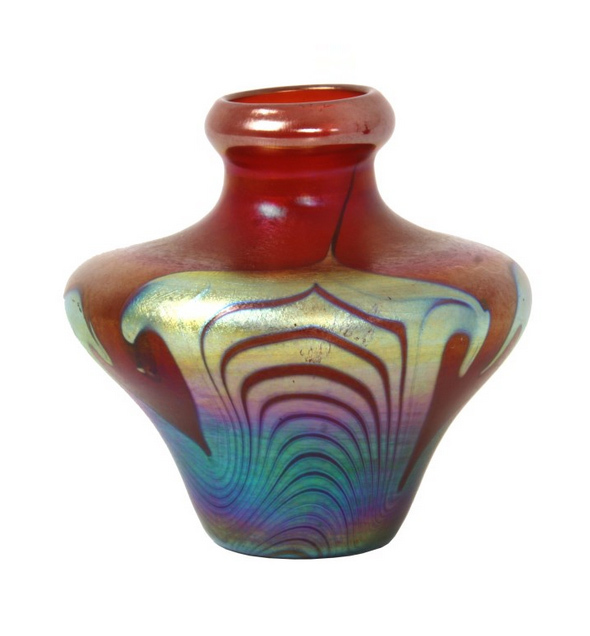 Pook & Pook sold a nice opalescent Ceylan vase for close to retail value. It realized $4,740, against a pre-sale estimate of $2,000 – $3,000. For the complete results of the sale, click on the following link. Pook & Pook Decorative Arts results. Our next show won’t be until July 27-29, in Redondo Beach, CA, but we’re still very much in business. Don’t hesitate to call or write, and let me know what you’d like to buy, sell, or trade.